Anthony Mann was a prolific director (42 credits) of Hollywood movies from the early ’40s to the late ’60s. Many might remember El Cid (1961) or Cimarron (1960). God’s Little Acre, based on the Erskine Caldwell potboiler, appeared (to high scandal) in 1958. The Glenn Miller Story (1954) still shows up on Old Movie channels. 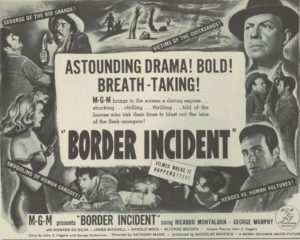 I had never heard of his 1949 Border Incident, however, until it showed up under his name on FilmStruck, a curated movie site I much enjoy. Filmed by John Alton in contrasting black and white with ominous shadows, radical camera angles and sneering mugs of the bad-guys of American film-noir, it is a pretty good combination of detective story, social commentary and good old fashioned fist-fighting. André Previn contributes a score aimed at signaling exactly what it does: danger, danger, danger! For a 1949 movie, it does a credible job of portraying the lives and fears of Mexican workers, picked out at shape-ups in Mexicali, provided with counterfeit work permits and bused across the border. Bribes are paid. The men are kept under-guard, and the promised pay — 25¢ an hour– is docked for food, bunk space and the trip across. Into the cross-border smuggling ring step an undercover American Immigration cop, Jack Bearnes (George Murphy) and his colleague, Pablo Rodriguez (Ricardo Montalban) from the Mexican Federales. Trouble ensues. Not all escape alive. A tense scene at a water tower lockup is surpassed by a scene with a wounded man and a giant disk-harrow as tense as anything I’ve ever seen, even with the B-level lighting and acting. 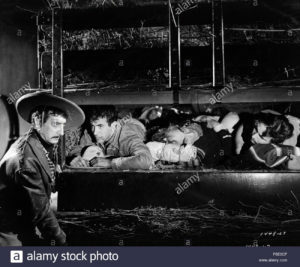 It is particularly interesting to see the film now, sixty-eight years after its release, when time, it seems, has stood still: immigrants and immigration agents still at the border, economic forces serving up anxiety, threats, criminal enterprises, death in the desert and fear, to citizen and non-citizen alike of raids, jail and deportation. Agribusiness, even then, with the legal Bracero program, couldn’t get enough cheap labor so smuggling was intense and lucrative. Growers and “contratistas” doing their share; workers doing what they had to to make a few dollars. If the acting isn’t all totally convincing and the music sometimes a parody of itself, well just enjoy. Mann and his costume designer tried successfully to replicate sombreros and shirts I still saw when I worked in Calexico, where it is filmed, with men of the post-bracero era, 1975. The scenery of sparse cactus, long dusty roads and rickety barbed-wire fences is true. The hard-faced anglo foremen, and henchmen, also true. During an authorized election for workers to decide whether they wanted to join a union I chased a Cadillac of such men, intimidating the voters, until I could wrench off the radio antenna. The actors portraying Mexicans aren’t totally convincing but quite a few of them have Spanish surnames and much, if not all, the Mexican tinged English sounds authentic. Montalban is almost fully convincing except, has his co-workers point out, he can’t be a real bracero. His hands are too soft. I’m pretty sure you’ll enjoy it — it’s available at least on Amazon for a couple of bucks– and I know it will be the only film you’ve ever seen in which US Immigration agents are shown as the good guys, racing to rescue a truckload of kidnapped illegals! The God Bless America ending is quite a kick, as well. Whether a hold-over from WW II propaganda films or a particular quirk of Mann’s I don’t know.